Serbo-Croatian (/ˌsɜːrboʊkroʊˈeɪʃən, -bə-/ (listen); srpskohrvatski / српскохрватски also called Serbo-Croat /ˌsɜːrboʊˈkroʊæt, -bə-/, Serbo-Croat-Bosnian (SCB), Bosnian-Croatian-Serbian (BCS), or Bosnian-Croatian-Montenegrin-Serbian (BCMS)) is a South Slavic language and the primary language of Serbia, Croatia, Bosnia and Herzegovina, and Montenegro. It is a pluricentric language with four mutually intelligible standard varieties. Old Church Slavonic was adopted as the language of the liturgy. This language was gradually adapted to non-liturgical purposes and became known as the Croatian version of Old Slavonic. The two variants of the language, liturgical and non-liturgical, continued to be a part of the Glagolitic service as late as the middle of the 19th century. The earliest known Croatian Church Slavonic Glagolitic manuscripts are the Glagolita Clozianus and the Vienna Folia from the 11th century. 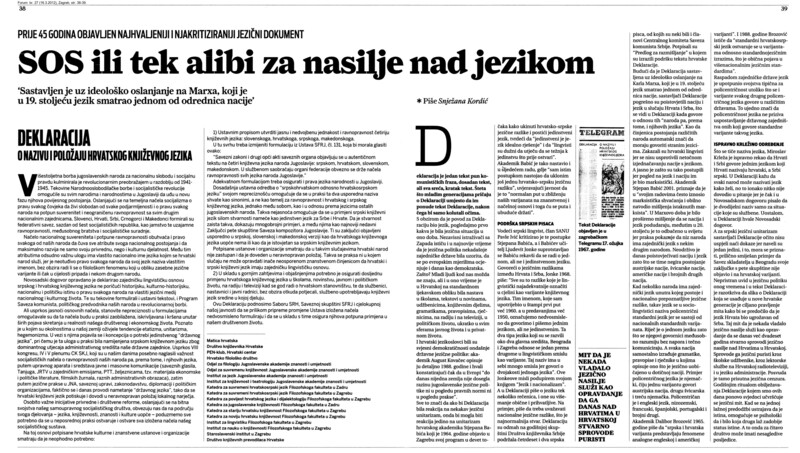 Enisa Kafadar argues that there is only one Serbo-Croatian language with several varieties. This has made it possible to include all four varieties in new grammars of the language. Daniel Bunčić concludes that it is a pluricentric language, with four standard variants spoken in Serbia, Croatia, Montenegro and Bosnia and Herzegovina. The mutual intelligibility between their speakers "exceeds that between the standard variants of English, French, German, or Spanish". Other linguists have argued that the differences between the variants of Serbo-Croatian are less significant than those between the variants of English, German, Dutch, and Hindi–Urdu. The Bosnian language ( (listen); bosanski / босански [bɔ̌sanskiː]) is the standardized variety of Serbo-Croatian mainly used by Bosniaks. Bosnian is one of three such varieties considered official languages of Bosnia and Herzegovina, along with Croatian and Serbian, and also an officially recognized minority or regional language in Serbia, Montenegro, and the Republic of Kosovo.Bosnian uses both the Latin and Cyrillic alphabets, with Latin in everyday use. It is notable among the varieties of Serbo-Croatian for a number of Arabic, Ottoman Turkish and Persian loanwords, largely due to the language's interaction with those cultures through Islamic ties.Bosnian is based on the most widespread dialect of Serbo-Croatian, Shtokavian, more specifically on Eastern Herzegovinian, which is also the basis of Standard Croatian, Serbian, and Montenegrin. Until the dissolution of SFR Yugoslavia, they were treated as a unitary Serbo-Croatian language, and that term is still used in English to subsume the common base (vocabulary, grammar and syntax) of what are today officially four national standards, although this term is controversial for native speakers, and paraphrases such as "Serbo-Croato-Bosnian" (SCB) or "Bosnian-Croatian-Serbian" (BCS) are therefore sometimes used instead, especially in diplomatic circles. Chakavian or Čakavian , , (Serbo-Croatian: čakavski [tʃǎːkaʋskiː], proper name: čakavica or čakavština [tʃakǎːʋʃtina], own name: čokovski, čakavski, čekavski) is a dialect of the Serbo-Croatian language spoken by a minority of Croats. It has a low mutual intelligibility with Shtokavian. All three main Serbo-Croatian dialects are named after their most common word for "what? ", which in Čakavian is ča or ca. Chakavian is spoken mainly in the northeastern Adriatic: in Istria, Kvarner Gulf, in most Adriatic islands, and in the interior valley of Gacka, more sporadically in the Dalmatian littoral and central Croatia. Chakavian was the basis for the first literary standard of the Croats. Today, it is spoken almost entirely within Croatia's borders, apart from the Burgenland Croatian in Austria and Hungary and a few villages in Slovenia. Croatian ( (listen); hrvatski [xř̩ʋaːtskiː]) is the standardized variety of the Serbo-Croatian language used by Croats, principally in Croatia, Bosnia and Herzegovina, the Serbian province of Vojvodina, and other neighboring countries. It is the official and literary standard of Croatia and one of the official languages of the European Union. Croatian is also one of the official languages of Bosnia and Herzegovina and a recognized minority language in Serbia and neighboring countries. Standard Croatian is based on the most widespread dialect of Serbo-Croatian, Shtokavian, more specifically on Eastern Herzegovinian, which is also the basis of Standard Serbian, Bosnian, and Montenegrin. In the mid-18th century, the first attempts to provide a Croatian literary standard began on the basis of the Neo-Shtokavian dialect that served as a supraregional lingua franca pushing back regional Chakavian, Kajkavian, and Shtokavian vernaculars. The decisive role was played by Croatian Vukovians, who cemented the usage of Ijekavian Neo-Shtokavian as the literary standard in the late 19th and the beginning of the 20th century, in addition to designing a phonological orthography. Croatian is written in Gaj's Latin alphabet.Besides the Shtokavian dialect, on which Standard Croatian is based, there are two other main dialects spoken on the territory of Croatia, Chakavian and Kajkavian. These dialects, and the four national standards, are usually subsumed under the term "Serbo-Croatian" in English, though this term is controversial for native speakers, and paraphrases such as "Bosnian-Croatian-Montenegrin-Serbian" are therefore sometimes used instead, especially in diplomatic circles. Dunaszekcső (Serbo-Croatian: Sečuv, Sečuj, Sečuh) is a village in Baranya County, Hungary, situated on the right bank (west side) of the River Danube. The inhabitants are ethnic Hungarian, with minorities of Serbs and Danube Swabians. The population was about 1900 in 2015. This is the list of Yugoslav submissions for the Academy Award for Best Foreign Language Film category. The award is handed out annually by the United States Academy of Motion Picture Arts and Sciences to a feature-length motion picture produced outside the United States that contains primarily non-English dialogue. It was not created until the 1956 Academy Awards, in which a competitive Academy Award of Merit, known as the Best Foreign Language Film Award, was created for non-English speaking films, and has been given annually since.For a complete listing of post-1992 submissions from countries of the former SFR Yugoslavia, please consult lists of Serbian, Slovenian, Croatian, Bosnian, Montenegrin, and Macedonian, and Kosovan submissions additionally. The Prague film school (Serbo-Croatian: Praška filmska škola, Прашка филмска школа), also known as the Czech film school (Serbo-Croatian: Češka filmska škola, Чешка филмска школа) or the Prague wave (Serbo-Croatian: Praški talas, Прашки талас) was a group of Yugoslav film directors who rose to prominence in the 1970s after graduating from the Film and TV School of the Academy of Performing Arts in Prague (FAMU). Five prominent Yugoslav directors born from 1944 to 1947 attended classes at FAMU: Lordan Zafranović (b. 1944), Srđan Karanović (b. 1945), Goran Marković (b. 1946), Goran Paskaljević (b. 1947), and Rajko Grlić (b. 1947). Emir Kusturica, who was born is 1954, is sometimes also considered a member of the Praška škola. Cinematographers Živko Zalar (who has worked with Grlić, Karanović and Marković), Predrag Pega Popović (who has worked with Zafranović and Marković), Vilko Filač (who has worked with Kusturica), Valentin Perko, and Pavel Grzinčič, also studied at FAMU.As they were all FAMU students at the end of 1960s and the beginning of 1970s, the directors of the Praška škola were mostly influenced by the directors of Czechoslovak New Wave, such as Miloš Forman, Jiří Menzel, and Oscar-winning FAMU professors, Ján Kadár and Elmar Klos. The events of the Prague Spring and Warsaw Pact invasion of Czechoslovakia in 1968 also strongly influenced the Praška škola and formed the basis for the loosely defined group. The Serbo-Croatian Wikipedia (Serbo-Croatian: Srpskohrvatska Wikipedia), is the Serbo-Croatian version of Wikipedia, the free encyclopedia. There are also national Wikipedia versions for the different standardised varieties of the Serbo-Croatian language, including: Bosnian, Croatian, and Serbian. As of June 2017, no Montenegrin Wikipedia exists. The Serbo-Croatian Wikipedia is the 20th largest Wikipedia in the world.This Wikipedia was locked in early 2005 due to inactivity, but was later re-opened. The Serbo-Croatian Wikipedia has 448,852 articles, comprising a total of 40.9 million edits. It is the second largest South Slavic Wikipedia in the world, after Serbian Wikipedia. Serbo-Croatian is a South Slavic language that has, like most other Slavic languages, an extensive system of inflection. This article describes exclusively the grammar of the Shtokavian dialect, which is a part of the South Slavic dialect continuum and the basis for the Bosnian, Croatian, Montenegrin, and Serbian standard variants of Serbo-Croatian.Pronouns, nouns, adjectives and some numerals decline (change the word ending to reflect case, the grammatical category and function) whereas verbs conjugate for person and tense. As in other Slavic languages, the basic word order is subject–verb–object (SVO), but the declensions show sentence structure and so word order is not as important as in more analytic languages, such as English or Chinese. Deviations from the standard SVO order are stylistically marked and may be employed to convey a particular emphasis, mood or overall tone, according to the intentions of the speaker or writer. Often, such deviations will sound literary, poetical or archaic. Nouns have three grammatical genders (masculine, feminine and neuter) that correspond, to a certain extent, with the word ending so most nouns with -a are feminine, -o and -e neuter, and the rest mostly masculine but with some feminine. The grammatical gender of a noun affects the morphology of other parts of speech (adjectives, pronouns, and verbs) attached to it. Nouns are declined into seven cases: nominative, genitive, dative, accusative, vocative, locative, and instrumental. Serbo-Croatian is a South Slavic language with four national standards. The Eastern Herzegovinian Neo-Shtokavian dialect forms the basis for Bosnian, Croatian, Montenegrin, and Serbian (the four national standards). Standard Serbo-Croatian has 35 phonemes including vowel length (30 according to traditional analysis which doesn't take vowel length into account): 25 consonants and 10 vowels (5 according to traditional analysis), and a pitch accent, whereas Montenegrin has two more consonants. Shtokavian, Stokavian or Štokavian (; Serbo-Croatian: štokavski / штокавски, pronounced [ʃtǒːkaʋskiː]) is the prestige dialect of the pluricentric Serbo-Croatian language and the basis of its Serbian, Croatian, Bosnian and Montenegrin standards. It is a part of the South Slavic dialect continuum. Its name comes from the form for the interrogatory pronoun for "what" in Western Shtokavian, što (it is šta in Eastern Shtokavian). This is in contrast to Kajkavian and Chakavian (kaj and ča also meaning "what"). The Socialist Republic of Montenegro (Serbo-Croatian: Socijalistička Republika Crna Gora / Социјалистичка Република Црна Гора) was one of the six republics forming the Socialist Federal Republic of Yugoslavia. It is a predecessor of the modern-day Montenegro. On 7 July 1963, the People's Republic of Montenegro (Serbo-Croatian: Narodna Republika Crna Gora / Народна Република Црна Гора) was renamed the "Socialist Republic of Montenegro" (a change ratified both by the Federal Constitution and the newly created Montenegrin Constitution in 1963) with Serbo-Croatian as the official language. In 1991, as the League of Communists in Montenegro changed its name to Democratic Party of Socialists of Montenegro after the first free elections, the adjective "Socialist" was deleted from the republic's title (ratified by the 1992 Constitution). The Socialist Republic of Slovenia (Slovene: Socialistična republika Slovenija, Serbo-Croatian: Socijalistička Republika Slovenija / Социјалистичка Република Словенија) was one of the six republics forming the post-World War II country of Yugoslavia. It existed under different names from 29 November 1945 until 25 June 1991. In 1990, while the country was still a part of the Yugoslav federation, the League of Communists of Slovenia allowed for the establishment of other political parties, which led to the democratization of the country. The official name of the republic was Federal Slovenia (Slovene: Federalna Slovenija, Serbo-Croatian: Federalna Slovenija / Федерална Словенија) until 20 February 1946, when it was renamed the People's Republic of Slovenia (Slovene: Ljudska republika Slovenija, Serbo-Croatian: Narodna Republika Slovenija / Народна Република Словенија). It retained this name until 9 April 1963, when its name was changed again, this time to Socialist Republic of Slovenia. On 8 March 1990, the Socialist Republic of Slovenia removed the prefix "Socialist" from its name, becoming the Republic of Slovenia, though remaining a constituent state of the Socialist Federal Republic of Yugoslavia until 25 June 1991, when it enacted the laws resulting in independence.